While I know that Wayne has done some work on Sundog, it has been quite some time since I’ve received any new information from Wayne on where things stand, so I have nothing new to report along those lines. 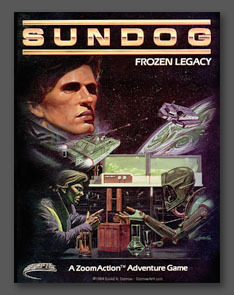 For those of you who wonder–yes, I am that Bruce Webster, the co-designer (along with Wayne Holder), chief architect, and principal developer of SunDog: Frozen Legacy, released by FTL Games in March, 1984, for the Apple II computer. I find it amazing that I still get numerous e-mails a year from SunDog fans. On the other hand, after over 30 years of software engineering, SunDog is probably the project I’m still proudest (and fondest) of. plus a place on The Giant List of Classic Game Programmers and its very own entry in WikiPedia. I co-designed SunDog with Wayne and did most of the coding on the Apple II versions (1.0, 1.1, 2.0). The Atart ST version — with far superior graphics and several nifty enhancements — was ported over (in UCSD Pascal, no less) by Doug Bell, Andy Jaros, and Mike Newton, though I’m told they left large chunks of my code intact. Also note that the great cover art (see image to the left) was done by David R. Darrow, who did the artwork for several other FTL games. This was the first (and, sadly, the only) SunDog game developed. As mentioned, Version 1.0 for the Apple II computer was released at the West Coast Computer Faire in San Francisco in March of 1984. At the show I logged some 30 bugs that showed up as people played the game in our booth. The good news is that all 30 were fixed within three weeks, which is when we released version 1.1 (with free automatic upgrades to all registered owners of 1.0). Only one “bug” was ever reported in version 1.1, and since that one allowed you to cheat at bars (swapping ale for expensive parts), few people complained. Version 2.0 of Frozen Legacy came six months later, in October of 1984. This was just an expanded and refactored version of the same game, taking full advantage of 64KB of RAM. (Version 1.0 had been designed to run in just 48KB of RAM up until about 3 to 4 weeks before release; we then switched to 64KB, but I couldn’t take full advantage of it.) Version 2.0 swapped less to disk, had better game play, and added some new features. By the time version 2.0 was done, I was burned out with software development. I resigned a week later, and–in spite of attractive offers from some other game design firms–was not able to work as a software engineer for nearly four years. Fortunately, I was able to do full-time writing as well as teaching computer science at a major university in the interim. The Apple II version of SunDog garned critical praise and was reviewed in publications as diverse as Rolling Stone, InfoWorld, and the Co-Evolutionary Quarterly. Popular Computing picked it as one of the “15 Best Computer Games of All Times”, though since that article was written 20 years ago, I’m not sure if SunDog would still make the cut. However, the Apple II version wasn’t a big commercial success. That had to wait for the Atari ST port, mentioned above, which was tremendously successful, as was FTL’s next game, Dungeon Master. SunDog didn’t start out being SunDog. Wayne and I first started working on a computer version of a ‘micro board game’ called “Star Smuggler” from Dwarfstar Games. However, Dwarfstar’s parent company (Heritage) went into bankruptcy before we could get a clear set of rights, so we had to chuck that effort and start over from scratch. SunDog (the name was Wayne’s idea) was the result. The setting, however, was eventually adapted from a multi-player computer BBS game I had been working on called “Blows Against the Empire“. The goal was to lead SunDog into some of the events and situations of that game. So a SunDog sequel–“Old Scores to Settle“–was planned from the start, and the Apple II version (2.0) mentions this game in its credits in the self-running demo. The goal of SunDog II: Old Scores to Settle would be to find out what really happened to your late uncle Brock (named, by the way, after Brock Meeks, a friend of ours who has since become both an award-winning international journalist and a stunning photographer), and the focus would be on interactions with non-player characters (NPCs). As mentioned, “Blows Against the Empire” (a title I borrowed from a Jefferson Starship album) started out to be a multi-player game run over a computer bulletin board (remember those? No? You’re probably too young) in San Diego back in the early 1980s. I still have many of the BATE documents and files and will post some of them to the SunDog archives here as I get time. As SunDog’s design and backstory developed, I started to steer it in the direction of BATE, so that SunDog III: Blows Against the Empire would find you dragged into empire-level issues and conflicts. So that’s it: SunDog in a nutshell. ..bruce..